County of Glamorgan: Aberdare (3), Gelligaer (2), Llanvabon [Llanfabon], Llanwonno, Merthyr Tidvil [Tydfil] (8), Rhigos, Ystradevodwg [Ystradyfodwg]. County of Brecon: Penderyn (2), Vaenor(2). The population falling within the union at the 1831 census had been 34,181 with parishes ranging in size from Rhigos (population 505) to Merthyr Tidvil itself (22,083). The average annual poor-rate expenditure for the period 1834-36 had been £7,546 or 4s.5d. per head of the population. The Board of Guardians held their first meeting on 3rd November, 1836, at the Castle Inn, Merthyr Tydfil, when the result of the Board elections was announced. Merthyr Tydfil was one of the areas that showed considerable resistance to the New Poor Law and to the erection of a union workhouse. For many years, a number of the union's member parishes declined to return a Guardian. The union, contrary to the wishes of the Poor Law Commissioners, also persisted in giving out-relief in the form of money. 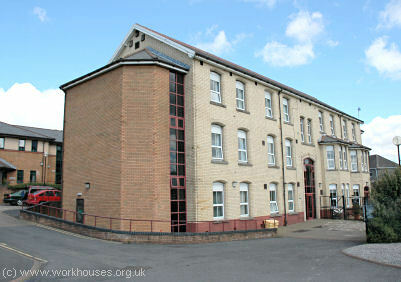 It was not until 1848 that the Board of Guardians were persuaded to undertake the building of a workhouse. However, for various reasons, including a cholera epidemic, it was not until the end of 1850 that plans were agreed upon. The new building, situated at the east side of Thomas Street in Merthyr, was designed by the firm of Aickin and Capes of Islington. It was to accommodate 500 at a cost of £10,000. In June 1851, the lack of progress by the original building contractor, Mr Hamlyn, of Bristol, led the Guardians to appoint the Cardiff-based firm of Messrs Henry Norris and Daniel Thomas to take over the contract. At the same time, alterations were made to the design, reducing the cost to £6,880. Because of the delay, the workhouse did not open until September 1853. The entrance block at the west of the site contained a porter's room, laundry and girls' school. Merthyr Tydfil entrance block from the west, 2000. 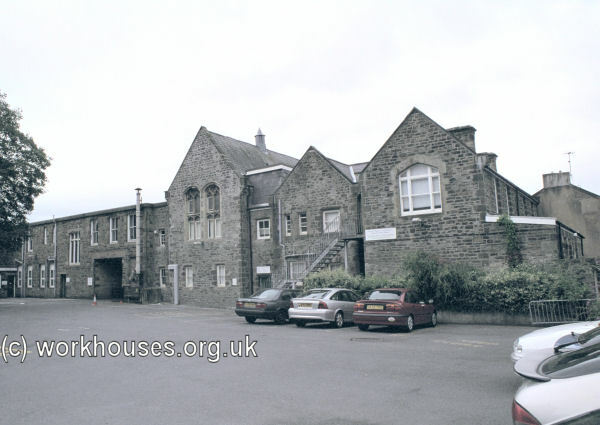 Merthyr Tydfil rear of entrance block from north-east (girls' school at left), 2000. The main block had a cruciform layout with men's wards at the west and women's at the east. 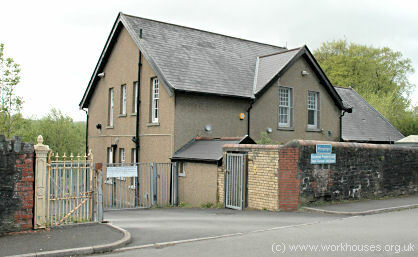 Merthyr Tydfil women's wards, 2000. A dining-hall, also used as a chapel, was located in the south wing. The north wing contained boys' and girls' school-rooms on the ground floor, women's wards on the first floor, and children's dormitories and a lying-in ward on the second floor. Merthyr Tydfil north wing, 2000. Immediately to the north of the workhouse site is a cholera graveyard. 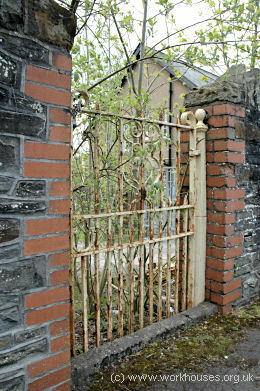 Merthyr Tydfil cholera graveyard, 2000. 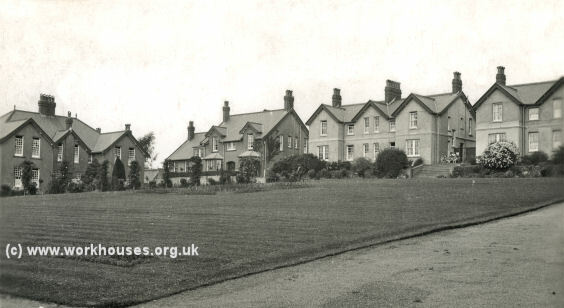 In 1899, a new hospital block was erected at the north of the workhouse. 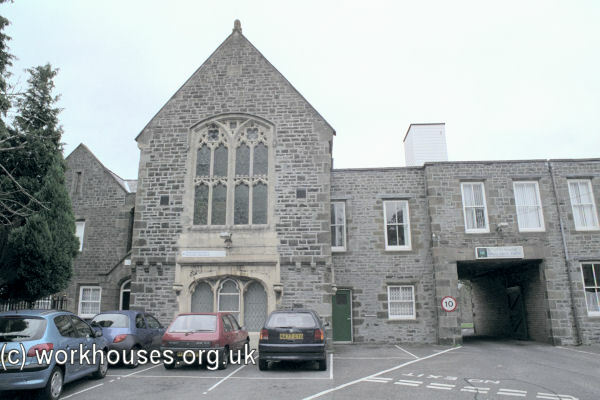 Merthyr Tydfil hospital block from the south, 2000. From 1904, to protect them from disadvantage in later life, the birth certificates for those born in the workhouse gave its address just as 44 Thomas Street, Merthyr. 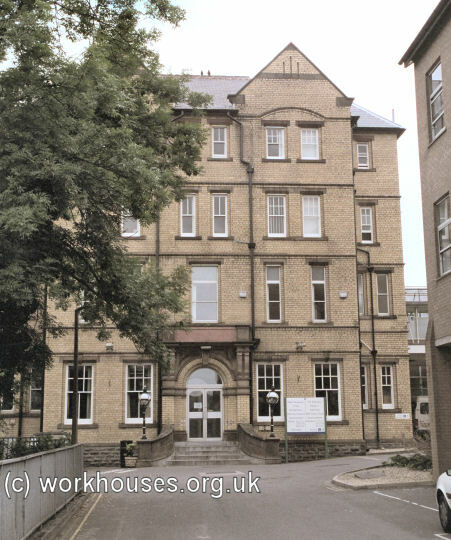 After 1930, the workhouse was redesignated as a Tydfil Lodge Public Assistance Institution, later becoming St Tydfil's Hospital. After the hospital's closure in 2012, the site was sold for redevelopment. 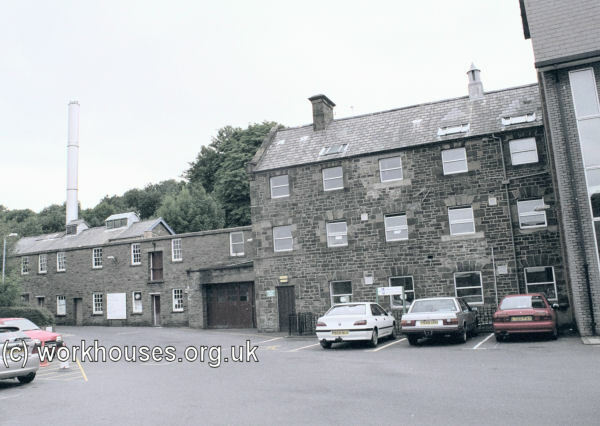 Most of the workhouse buildings were demolished in 2015 although the entrance block is now a listed building. In the 1870s, a fall in the price of coal and iron led to a recession with a reduction in workers' wages in South Wales industrial towns such as Merthyr Tydfil. A number of strikes resulted, the most significant of which began on January 1st 1875 after a 10% reduction in colliers' wages. The employers responded to this action with a lockout. The Merthyr Guardians, themselves mostly mine and iron-works owners, initially refused to offer any relief whatsoever to single men on strike. At the end of January able-bodied men were offered a "labour-test" — out-relief in return for performing a task of manual labour. The usual task to be employe was stone-breaking — large stones had to be broken to pieces that would fit through a 2¼-inch gauge grid, for which men were paid 1/- per cubic yard for limestone, or 1/4d per cubic yard for field or quarry stone. From February 19th, the Guardians decided that all single men should thenceforth only be relieved via admission to the workhouse. 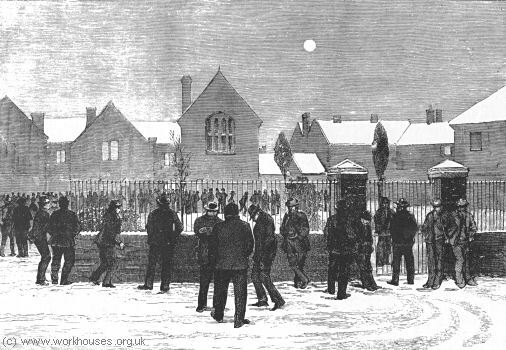 The situation escalated on 27th February when 900 single, able-bodied men converged on the workhouse demanding relief. The master admitted as many as there was room for, then turned away the rest. Those who had been admitted, tried to destroy workhouse discipline and four policemen were moved in to keep order. In mid-March, when the supply of suitable task work ran out, the Dowlais Iron Company offered colliery work as a substitute, which would have effectively broken the strike. The workers held out against this but, by May, they had been starved out and the strike collapsed. Striking workers outside the Merthyr Tydfil workhouse, 1875. A similar situation occurred in 1898 when wage-cuts by the employers resulted in another five-month-long strike. With the support of the Local Government Board, strikers were again offered an outdoor labour test. At the end of the dispute, colliery owners challenged the legality of providing such relief to strikers. In 1900, the Court of Appeal issued what became known as the Merthyr Tydfil judgment. It decreed that, regardless of his being on strike or not, an able-bodied man who could not work was not entitled to poor relief unless he was too exhausted by his situation to be capable of working. It was ruled, however, that the wives and families of strikers could claim poor relief. Unmarried strikers thus had no access to poor relief until they had become to debilitated to work. 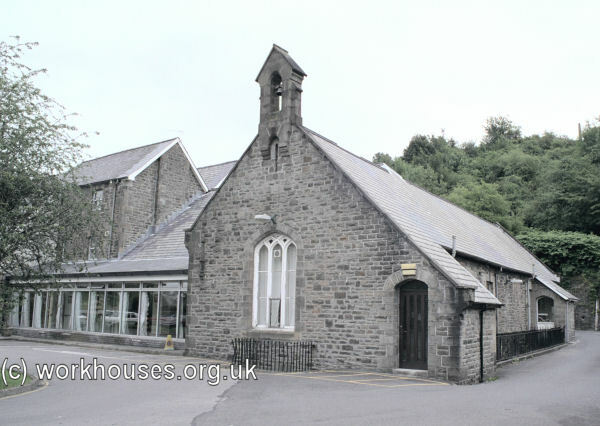 In 1871, the Merthyr Union erected an infirmary at Llewelyn Street, Trecynon, Aberdare. However, the premises proved to be unsatisfactory and in 1877, the site was converted to an "industrial school" for 124 children. The school was intended to educate pauper children away from the influence of the main workhouse. They were given training in different trades and occupations. An "Industrial farm" also operated at the north of the school site. The school became known a "training school" from about 1895 and in 1904, four cottage homes were erected nearby. Aberdare Industrial School site, 1898. 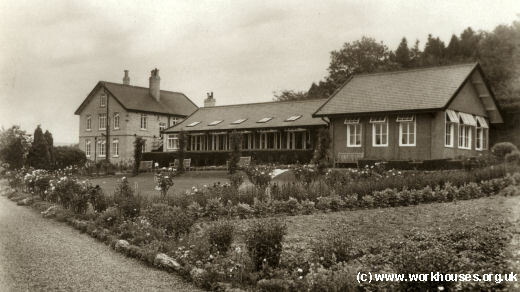 Following the opening of the large cottage homes site at Llwydcoed in 1912 (see below), the training school was converted for use as a branch workhouse. Aberdare branch workhouse site, 1921. The site later became the Tegfan Hostel. It is now occupied by various facilities for the elderly. From around 1909, further cottage homes were erected at Cefnpennar Road, Cwmbach; Hirwaun; Beech Terrace, Abercwmboi; Bargoed; and Glannant Street, Aberdare. Each had a foster mother looking after a small group of children. 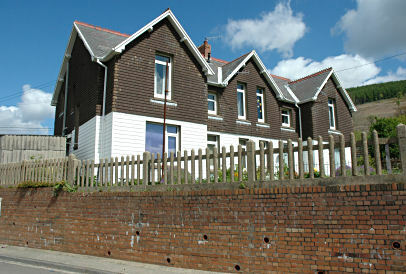 A receiving home for children was also built in Llewelyn Street, Trecynon, adjacent to the Training School. Cwmbach cottage homes site, 1921. 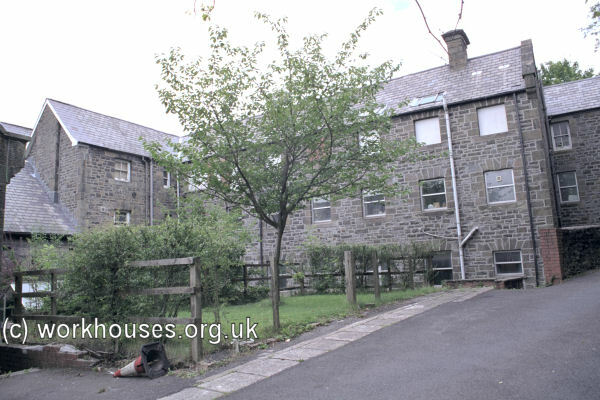 Between 1912 and 1919 a new site at Corner House Street, Llwydcoed, near Aberdare, was developed as cottage homes for children, with an administrative block and receiving home. Llwydcoed cottage homes site, 1921. 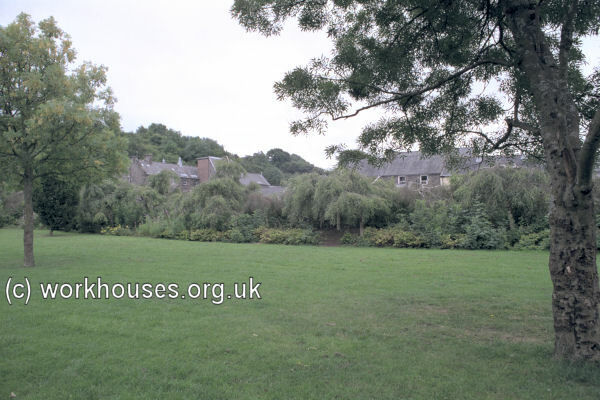 Merthyr Llwydcoed Homes from the south-east, 2005. Merthyr Llwydcoed Homes entrance from the north-east, 2005. The Llwydcoed Homes were later taken over by the Glamorgan County Council and the site became known as Penybryn. Two institutions were provided by the union the elderly. 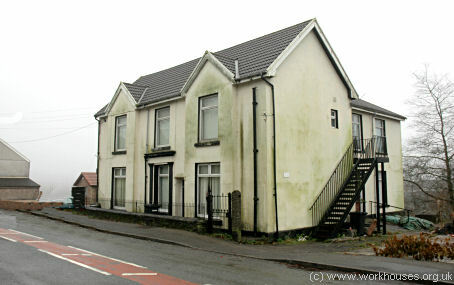 From around 1912, Pantysgallog (or Pantyscallog) House on Pant Road in Dowlais accommodated elderly and infirm women. 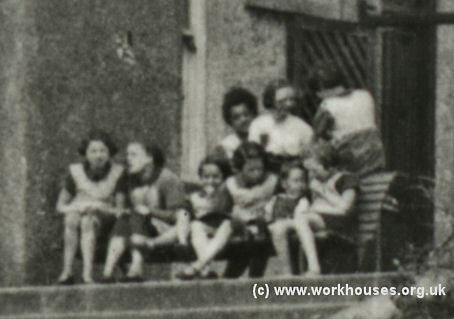 At around the same date, Windsor House was erected at the east side of the Trecynon workhouse site. Both these institutions were administered as part of the workhouse. During the First World War, the site was used as a military hospital. After 1930, the workhouse and infirmary became Public Assistance Institutions under the control of the local council. Only Windsor House survives on the Trecynon site as part of Tegfan Home for the elderly. 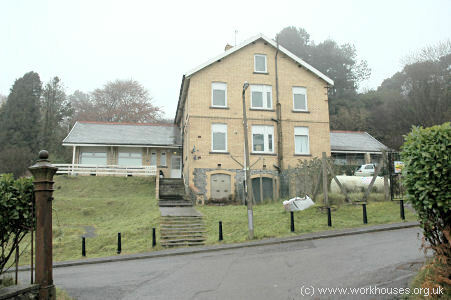 In 1913, a sanatorium was built near Pontsarn, in the parish of Vaynor, a few miles to the north of Merthyr Tydfil. Only the central block now survives, converted to residential use. Thanks to Glamorgan Record Office for information.